When Barney's creators got the thumbs up for a PBS television series in 1991, they had one small problem: no writers. I had previously voiced interest in working with the company, and in the end I was one of only two writers hired to help develop the series format, characters, and write scripts. The other writer was Mark S. Bernthal, who is a great friend of mine, and who is still actively engaged in a variety of entertainment projects. Neither Mark nor I, nor the producers, knew that two writers weren't realistically enough to write so many shows. But somehow we managed to, even netting an Emmy nomination for "Best Writing in a Children's Series." During that first season, I made a cameo appearance as "Rainbowbeard the Pirate," who magically appeared from an attractive leather-wrapped chianti bottle which (in real life) I'd purchased at a neighborhood garage sale. Rainbowbeard is still considered one of the most terrifying characters to ever appear on Barney & Friends. Or maybe he was the most terrified character. I developed a whole new respect for the kids and actors who had to memorize lines, hit their marks, AND dance (frequently inside dinosaur costumes)! I continued writing "Barney & Friends" episodes through the 2006 season. I have no idea how many individual episodes I wrote, though "scads" and "oodles" would certainly apply. I've written a lot of other things for the Barney franchise, too, which you'll find listed beneath the following gentle rant. A SHORT EDITORIAL on "Barney & Friends™"
Before I go further with the career rundown, let me say a few words in general about Barney. These are my own personal thoughts and opinions, and I'm not speaking for anyone else, officially or unofficially. Got it? Then read on. In 1991, I entered into the show as a parent who wanted to create wholesome entertainment for very small children like my daughter, and also as a "child of the 50's" who'd been brought up on shows like Captain Kangaroo, the Mickey Mouse Club, and Roy Rogers. Back then (you young whippersnappers), TV shows included straightforward moral values for kids: telling the truth, being kind to others, being helpful. At "Barney & Friends" we tried to present those same fundamental values in a way that made them meaningful and accessible to very, very young audiences. And somehow, this was now deemed to be "controversial." Other people thought that the show was "too sweet," as if saying positive, encouraging things to toddlers was a sin. Still others thought that the show was vapid and meaningless, presumably because they already knew their letters, numbers, and colors...even if they'd clearly forgotten their manners. 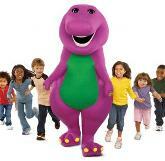 But Barney & Friends was filled with educational material for the very young. Packed solid. Yale University researchers Dorothy & Jerome Singer called the show the "model of what preschool television should be." In an average episode, we included something like 200 age-appropriate teaching points for the very young (guided, I must add, by the show's terrific researchers). Writing an episode of Barney was hard, because you needed to consider the impact of every word, every image, every detail of child development. And then you needed to make it all look simple and fun. While singing and dancing. Kids, and parents who could look through the eyes of their children, "got it." They embraced the character and the concepts and incorporated them into their daily lives. And that's really what mattered most to me. I can look back on nearly two decades of involvement with Barney, and feel pride in having been part of something which was unabashedly and unapologetically dedicated to giving kids life-lessons about safety, sharing, caring, self-esteem...and yes, love. I wonder if the many critics and cynics who preferred to teach 2-year-olds that "the world is a bad place, and the sooner you learn it the better" have that same sense of pride about what they've accomplished? I wonder if they even have a clue how the world they live in got to be such a bad place? With a little bit of introspection, they might find the answer uncomfortably close to home. Despite being active in video and audio scripting and production, I've always enjoyed writing Barney preschool books because I think reading is so important. Moreover, simple picture books are a great shared experience between parent and child. Writing good books for very young readers isn't brain surgery, but it's harder than most people think (if you're doing it right). Frankly, people who say they can't write a "real" book but think they can write a children's book are revealing a complete lack of respect for both children and writers. The fact that there are very few words on a page means you have to choose those words carefully. Moreover, it's likely that the book will be read aloud to a child, which means that the words actually need to SOUND good when spoken. Lots of things look great on the page, are spelled correctly, and are perfectly grammatical...but can become clumsy tongue-twisters when read aloud. A good children's book - and there are plenty of them - should roll off the tongue like poetry or a song lyric. The words carry their own built-in rhythm and cadence. And that makes for a happy experience for both the reader and the listener. At last count, I think I'd written over 30 books for Barney. There are sound books, shape books, books told in rhyme, and more. 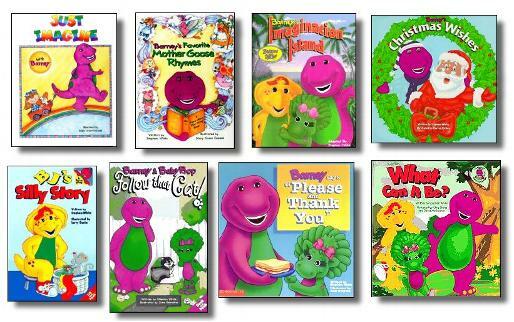 Whether you're reading Barney books or other books for your kids, please help them develop a love of reading early on. It's far more important than watching television (yes, even "Barney & Friends"). 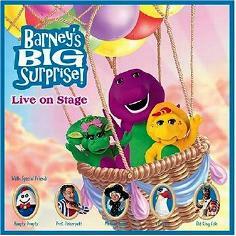 As a little yellow friend of mine has been known to say "Ai-yi-yi, Sissy..."
Barney's Great Adventure was Barney's first and, to date, only theatrical release. It took a long time to get it made, and a lot of revisions to the script. There are people who actually love the movie, and to them I say "that's nice." Personally, I was disappointed in the end result. 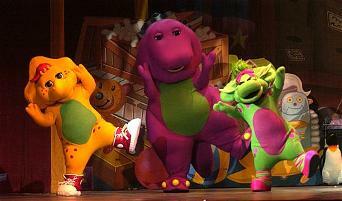 Most of the talented team that made the Barney videos in Texas weren't considered "Hollywood" enough for this comparatively big budget project, and so a lot of people got involved who didn't understand the character, the franchise, or as nearly as I could tell, what it means to be a child. Heck, I don't think some of them even liked children. By the way, just between you and me, you know Twinken™, the odd little koala bear with the "Something About Mary" hairdo who hatches out of the egg at the end? The hovering teddy bear who flails his arms without speaking and shoots sparks from an undisclosed area just under his tail? Well, he wasn't in the original script. In the original script, the giant "space egg" which Barney and the kids have been chasing doesn't hatch a bear, it hatches a bird. A cute little baby bird who misses his mother. And in the end, Barney helps reunite the two, while bringing the human families closer together too. It could've been a terrific movie, honest. Of all the various Barney projects I've worked on (and by now, you should be figuring out that's a LOT), the concerts are the most exciting. When working on television shows, you know that a scene can be shot as often as necessary to get it right. When you're writing for the stage, you know everything has to work exactly right the first time, every time...and the script had better help make that possible by considering the props, staging, lines, costume changes, special effects, and a lot more. But most importantly, the live shows and concerts have given me a chance to get out and see Barney's audience...happy kids (and happy parents!) having a great time. Usually, writing for Barney is something that happens at my in-home office, all by myself. By the time shows are being shot, I'm far down the road on another script. So I love being able to see the live audiences cheer, laugh, sing and applaud! 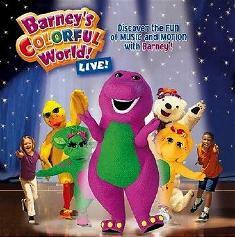 This was Barney's (and my) real onstage debut...and it remains the scariest project I've ever worked on! I'd never been to New York or seen a live stage production when I was flown to Radio City Music Hall to watch their eye-popping annual Christmas Extravaganza. It was an incredible show, with live animals, ice skaters, and tons more on that giant (really, REALLY giant) stage. And somehow I was going to have to fill it. Yikes! We were short on time, but not on enthusiasm - and the show came together very quickly, with lots of spectacular scenes, songs, and stage effects. There was, however, one little problem: as the days and hours ticked down to opening night, we never completed a successful rehearsal on stage. We didn't even come close! On opening night, with Radio City packed (the complete run of the show was the 2nd fastest sell-out in Radio City history - we were edged out of the top spot by Bette Midler) the lights dimmed, the curtains opened...and magic happened. Everything worked, for the first time ever. The crowd went wild. I still believe that it was the good will of all those children that somehow made the show work that night. So thank you, kids, wherever you are! While the Radio City Music Hall concert was great, and went on to be very successful as a video, the show was never intended to go on tour (many of the sets could not be transported, and frankly there's NO stage like Radio City). 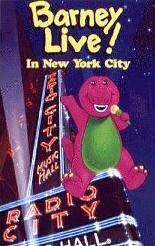 "Barney's Big Surprise" was the first concert tour for arena-sized stadiums, and we pulled out all the stops. There were lots of great songs and visuals, and it was a pleasure to have actor Barry Pearl reprise his role of "Professor Tinkerputt" (from the NBC special "Barney's Imagination Island") for live audiences. The showstopper in this concert was the "Old King Cole" song which capped off a lengthy "Mother Goose" segment. When Old King Cole started rockin', it was party time! The show was eventually seen by over 2 million people, and was named "The Best Family Touring Show of The Year" by Performance Magazine. The next touring concert I wrote was "Barney's Colorful World," which took our band of performers to all corners of the globe: the jungle, the beach, the arctic, and even undersea! The Jungle Set, in particular, got appreciative "oohs" and "ahs" from the audience, as did the life-sized elephant (a costume, unlike the REAL elephant we used for the Radio City show) who danced onstage. Another crowd pleaser came during the undersea portion of the show, in which an undulating starfish flipped around to reveal that he was wearing gold sequins and Elvis Presley-style shades and sideburns! He did a pretty good imitation of "The King" for his song and dance, and the audience was still cheering for more when BJ announced: "Ladies and Gentlemen, the Starfish has left the building." 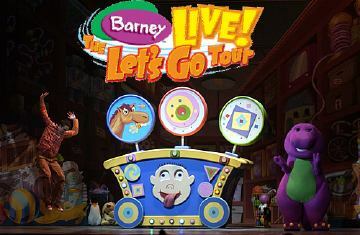 Barney's 2006-2007 Tour was rather cryptically titled "Let's Go" because a number of Barney videos with "Let's Go" in the title had sold well (like "Let's Go to the Zoo" and "Let's Go to the Farm," both of which I wrote) and the good folks in Marketing thought that "Let's Go" must therefore be magic words. No, really! They had Powerpoint presentations and everything! In script form, the show was called "Barney's Tee-riffic Toy Factory" because that's what the show is really about: a visit to a toy factory where the toys come to life...with a little help from Barney and the audience's imagination, of course! The "Let's Go" Tour is currently (spring 2008) touring the UK, and hasn't yet been released on home video. I'm hoping it will be soon! I've always enjoyed writing and performing music, and Barney has given me an opportunity to do a fair amount of songwriting over the years. No, I didn't write "I Love You" or any of the big hits, but I've had an enjoyable sprinkling of tunes and lyrics get into the shows over the years. TRUE STORY: Two of the songs I'm happiest about writing are "Buckle Up My Seatbelt" and "When I Walk Across The Street" (which teaches kids to "stop, look, and listen" and "hold hands with a grownup" before crossing a street). A mom wrote to the show to say that her toddler, in a baby seat in the back of the car, started urgently singing "Buckle Up My Seatbelt" while the car was stopped at a red light. Something was wrong, and this was the only way the child could communicate it. Mom looked and found that the child's seatbelt had come unbuckled. She was able to latch it before the light turned green again. At the next intersection, someone ran a red light and rammed the car, flipping it over. Mom and baby both survived, but according to police the seat belt saved the child's life. Whoa. On a lighter note (or series of notes), for "Barney in The Land of Make Believe" I had fun writing "The Not-So-Magical Magician," For "Barney's Best Manners," I wrote "The Topsy-Turvy Tea" (which was set at the Mad Hatter's tea party, from Alice in Wonderland). And for "Barney's Imagination Island," I wrote the calypso-themed "That's What An Island Is" which is, I admit, so contagiously catchy that it is still outlawed in 17 states. On many of these songs, and a couple of dozen others, I collaborated with Bob Singleton, who did much of the music for the series (and albums) over the years. Bob is an award-winning, multi-talented. super-nice guy. Hey, I calls 'em the way I sees 'em.